A fine theme for story-tellers. 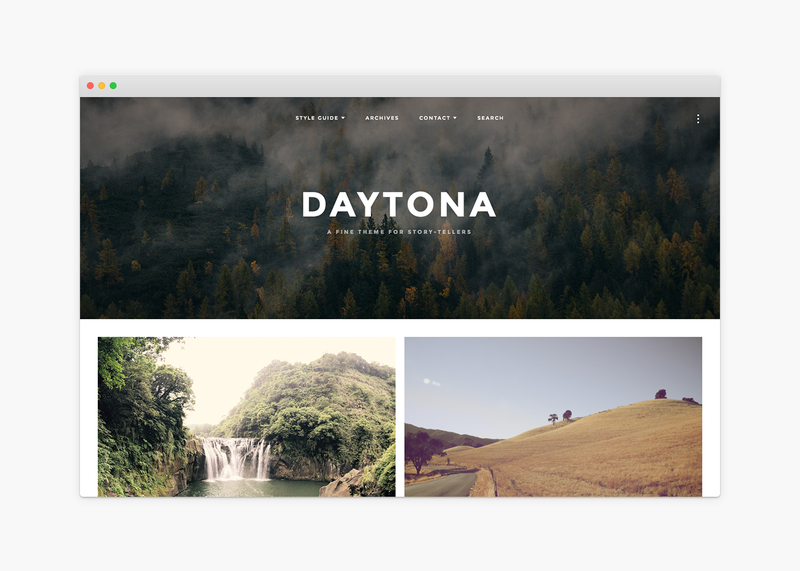 Meet Daytona, a fine theme for story-tellers. Easily create beautiful photography-driven stories with images, galleries, video, audio and more. The 10 different blog layouts/grids allow you to offer your visitors are truly memorable experience. Use Daytona as a photoblog, a portfolio for your work, a food blog, a fashion blog or a magazine. The clean and minimal look & feel is a perfect match for any type of content. No less than 10 grid layout options are available for you to choose from, for a super clean presentation. Create beautiful looking posts and pages by adding full width hero images or videos to spice things up. Make Daytona really yours and match your personal branding and taste with the WordPress native Customizer. Have your audience easily and seamlessly browse your site without reloading pages with Infinite Scroll. Beautiful designs, unmatched support, & clean code to match. Built with user experience in mind all themes are are breeze to work with, for both novice and experts users. Extreme attention to detail in design and code make for great looking, easy-to-use and speedy themes. Your website will look just as beautiful on your mobile devices and displays as it does on your desktop. Themes built with a purpose allowing the elimination of bloat so you can focus on what you do best! Easily make a theme yours to match your personal taste and brand with the WordPress native Customizer. Want to go beyond English? No problem. Easily translate your theme with the packaged translation files. Check back regularly for new releases that might just inspire your next online project. Go for it! Regular updates ensure your theme is always up to date allowing you to use your theme worry-free. Everything you need to know about how to get started and keep you going can be found in the support area. Check the theme collection and find a theme you like! Be the first to know when a new theme is released, and perhaps receive the occasional update! Sign up below. Spam excluded.